There are many opinions when it comes to the question whether gold is overvalued. Last three months gold reached historical high and traded in consolidation leaving open question for further rise. 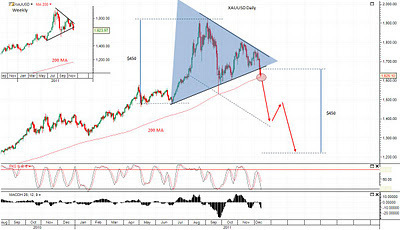 From fundamental point of view latest developments in global financial system set bearish note for the precious metal. Weakness in Europe have risen dollar’s value as investors stay away from euro denominated assets, thus lowering gold price. Another threat for gold price is slowing growth in main gold markets China and India which leads to low demand. Combination of above mentioned factors support current weakness of the commodity and short term outlook is negative. 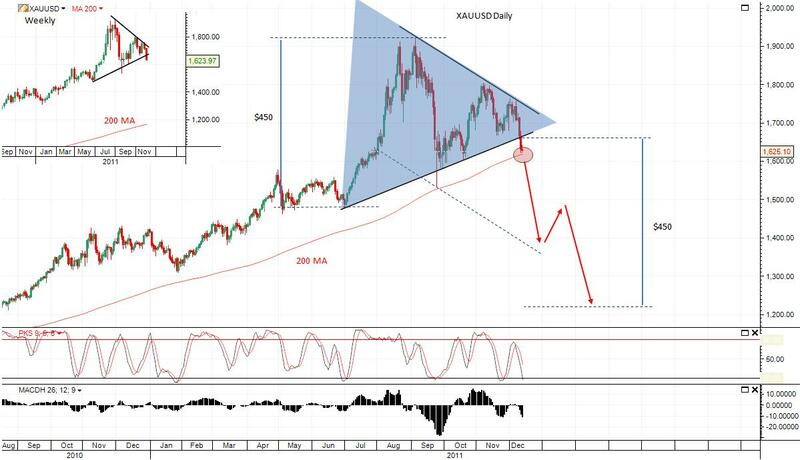 Technically last few months gold consolidates and trades in technical triangle. Exit from this technical figure has two outcomes – braking up or downward. Usually the following move coincides with the triangle height (in our case approximately $450). After last three sessions the price broke down the triangle, which could trigger steep correction to $1200 in next few months. Close under the strong support on a daily chart - 200 MA (at $1618) is confirmation for prolonged bear move. Next major support would be the 200 MA on a weekly chart - approximately $1200 suggesting extremely bearish move. 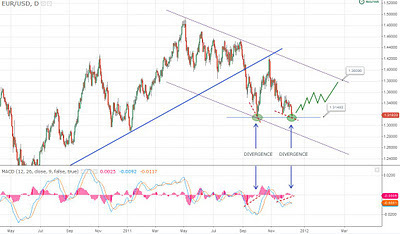 The divergence between the price and MACD occured in September 2011correctly signaled reversal of EURUSD. After yesterday close another devergence has been spotted. It coincides with strong support level formed from previous bottom at 1.3150. 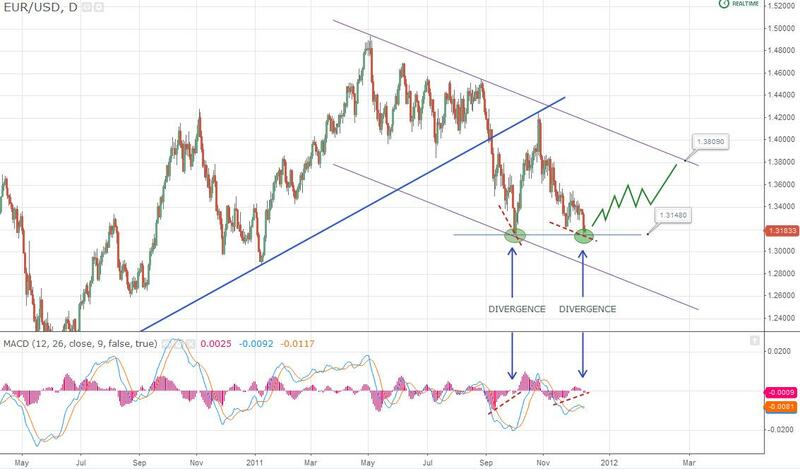 The double bottom and divergence form strong indication for trend reversal with target 1.38. SLW is trading in positive parallel channel within bigger negative one. Positive markets and silver move could drive price to $38, otherwise $24 is the support level. It is important to know what would be the effect of eventual government default. Reuters Breakingviews has created stress test calculator for estimating what possible implications to Euro banks and governments in such case would be. Recently conducted stress test of European banking system in July has been widely criticized. Often stated was the fact that requirements in the test were lowered, which question credibility of the test. According to the results most of the EU lenders had enough capital to sustain tough economic conditions. The problem is that minimum capital requirement in the test conducted by EBA (European Banking Authority) was 5%, far low below EBA’s current 7% threshold. Moreover after latest painful developments European banking regulator has discussed option for rising capital requirement to 9% as additional buffer. Another pitfall of the test is that includes only half of EU banks and excludes smaller ones. The Breakingviews Euro Zone bank stress test aims to be more stricter than previously conducted. There are some details to be considered when reading the output. As described in the test notes it uses the same data as EBA. 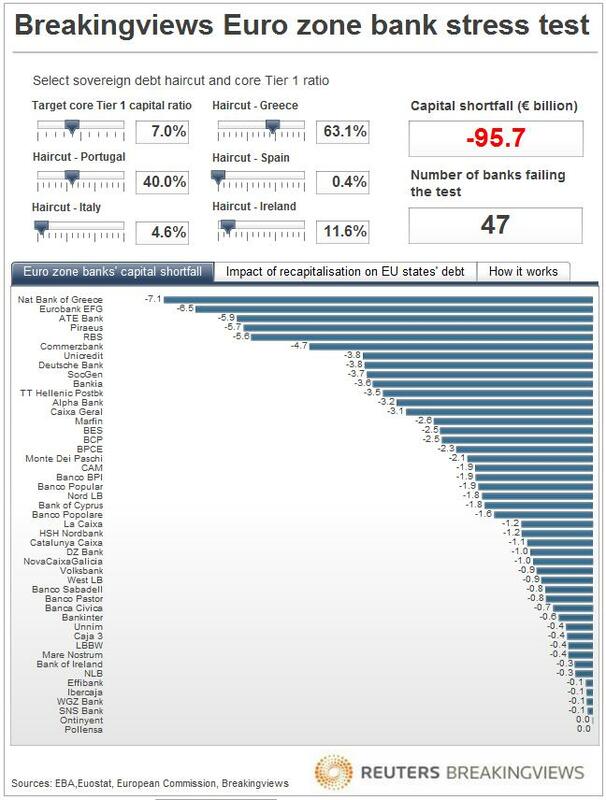 Results show how many banks would fail, which of them will suffer most, what amount capital is needed to cover core Tier 1 ratio and the impact of the recapitalization on each Eurozone country’s debt. General assumption is that calculations are made with 12 Oct market prices for 5 year bonds. 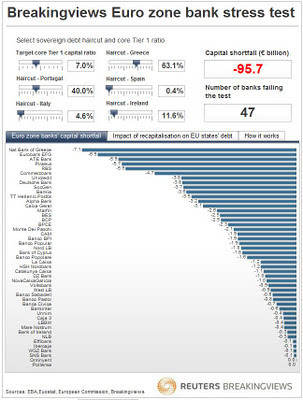 If we consider 63% Greek bonds haircut and 40% Portugal with 7% Tier 1 capital threshold, then capital shortfall would be €95.6B. 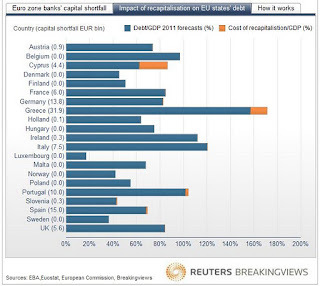 Most of the burden has to be taken from Greece as €31.9B must be raised, Spain - €15B, Germany - €13.8B. In this case most vulnerable are Greek banks: NBG, Eurobank EFG, ATE Bank, Piraeus, Italian Unicredit, German Commerzbank and Deutsche Bank. If we assume worst case scenario with Spanish and Italian haircuts of 30% (added to Greek and Portugal) and implementation of 9% core Tier 1 ratio, the picture looks ugly. Banks considering significant capital shortfall are – Unicredit, RBS, BNP Pariba, Santander, Banco Bilbao, Deutsche Bank, Commerzbank. 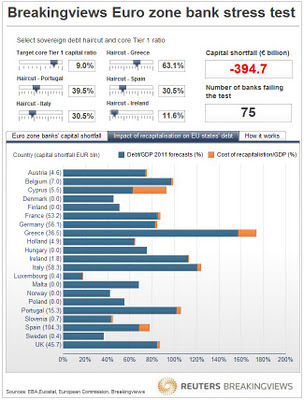 Capital shortfall is close to €400B. In this case Spain must raise additional €104B, Italy - €58B, Germany - €53B, France - €53B, UK - €45B. Unfortunately in such conditions credit markets are practically paralyzed and funding is impossible. Where does money come from? The European Financial Stability Facility (EFSF) was designed to help stressed EU countries. With latest approval for increase of its funds to €780B there should be some relief that even worst case scenario is manageable. After the both tests conclusion is that there are certain banks considered to bear additional risk of capital shortfall in extreme conditions. Countries with highest recapitalization level (cost of recapitalization/GDP) are Greece, Cyprus, Portugal, Spain, and to lesser extent Germany, France, UK, Italy. In real terms, however, Spain, Germany, France, UK have greater impact of recapitalization related to total shortfall. It is clear that problems are not lack of funds but rather lack of decisions i.e. political willingness for quick resolving of the crisis. You could perform your own stress test here! Is 2008 Comming Back Again? If you look around there are many similarities. Should we worry about next economic downturn or market crash? Almost one month ago markets enthusiastically cheered EU leaders’ agreement over Greek debt drama. Since then, however, the situation is not getting any better. This is obvious looking at the market indices performance over that period. 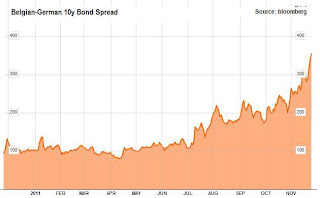 S&P lost 9.85% since its 27 Oct. peak, yield on Italian, Spanish and even Belgian government bonds are persistently climbing despite ECB efforts to keep them low. There are more and more signs that we could face similar financial storm. Growing borrowing costs, freezed credit markets, higher volatility and frightened investors are common scars between present and 2008. Current problem has no short term solution as it have been accumulated over years. Now we are witnessing painful process of deleveraging which could last longer than previously thought. The core of the entire mess is lost credibility as it appeared in 2008. This is seen with undersubscribed German bond auction few days ago. According to the latest research Japan investors prefer investing in UK gilts rather than German bunds. As to Japan it is one of the countries with highest level of debt as percentage of GDP (199%* as of 2010 according to CIA) and Standard&Poors has risen concerns over its ability to reduce it. As result is latest announcement from the rating agency for possible credit rating downgrade. This could be additional shock to already vulnerable markets. Back to Europe France’s credit rating could also be reviewed as consequence of possible rescue plans for Belgian bank Dexia which suggest higher French involvement. Markets have been calculating eventual difficulties since July as spread between German and Belgian bonds is gradually widening since then. In addition Italian yields are stubbornly staying above crucial 7% level despite massive buybacks from European Central Bank. Up to now ECB manages to keep situation under control but rising speculation and losing investors’ confidence could undermine those efforts if market switch to panic mode. Considering all latest developments Federal Reserve recommended stress test to largest US banks. Such step in current situation is two sharp knife. Good results could strengthen investor and banking management confidence in the system but the fact that this test is undertaken now suggest growing concern for the economic conditions. Negative news continues flooding news wires and we imperceptibly go to downward spiral. To get out of this firs and most important is returning credibility. This is the toughest part of the plan. Unfortunately Eurpean leaders still lack necessary attitude to return investors trust. In addition in most troubled countries there are no signs for growth, hence difficulties paying their obligations rise which additionally frustrates investment public. Ultimately help from countries with cash surpluses such as China is logical solution but for now there in not clear sign for action in that direction. Definitely there are difficult times ahead but situation if still far from 2008, at least for now. Realization of consequences of destructive event such as defaulting of given (European) country has led to enormous efforts toward resolving the problems. Decisionmakers pressured from financial markets have no other choice accept moving toward stabilization. Election of new technocrat governments in South Europe prove the process is on the move. Specialists take responsibility now and crucial steps have been undertaken. Unfortunately measures for restructuring debt levels taking place now will have long term impact. Short term improvements are needed at the moment because new failure similar to Lehman Brothers this time of government scale could destroy entire financial system. The world cannot afford another financial disaster. Important decisions in Europe have to be made untill 8-9 Dec. (European leaders meeting) hopefully it is not too late. It is clear that better buying falling stocks than skyrocketing, which is not to be mistaken with buying bad stocks. Opening position in oversold market is one of the keys for successful trading as you buy at discount. The fortune question is when is that time? Recent correction has uncovered numerous opportunities and still the markets are falling. 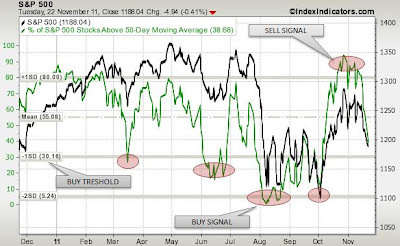 Closer look at market breadth indicators could give us perception about current market mood. 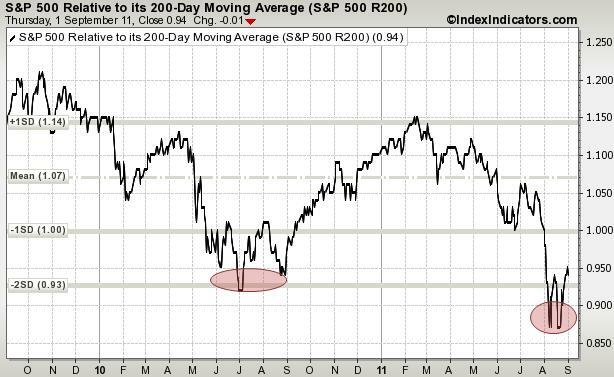 To measure current market state we use numbers of stocks in S&P index above its 50 day moving average. Latest pullback of the index drove percentage of stocks above mentioned level to 38.7%, lowest since early October. The threshold indicating buying signal is 30%. That level is -1 standard deviation from its mean and is considered to be extreme level. 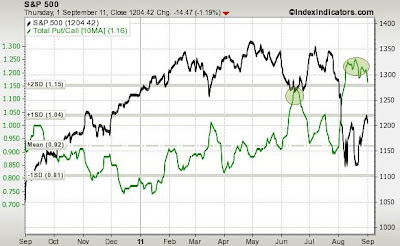 As indicated on chart numbers under 30% coincide with correction bottoms. 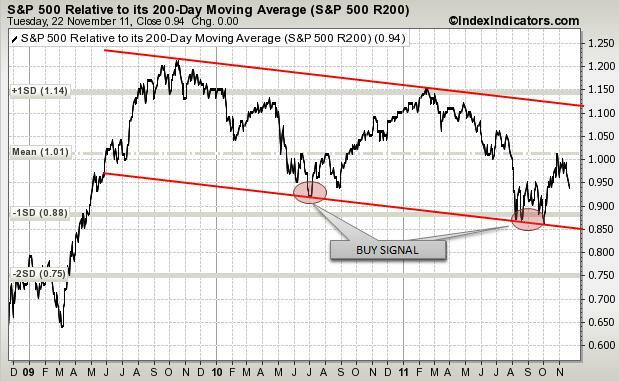 Quick view of the long trend indicator – S&P relative to its 200 day moving average suggest market is under the trend. 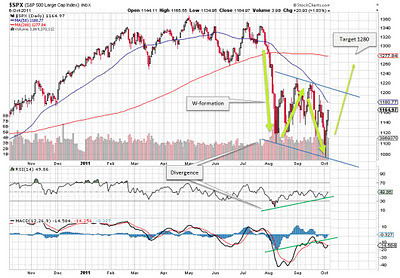 Long term trend of the indicator itself is negative showing markets having bigger slumps under its 200 day MA. Fear gauge VIX is still leveraged now at 32. Readings above 30 indicate downturn and high volatility. 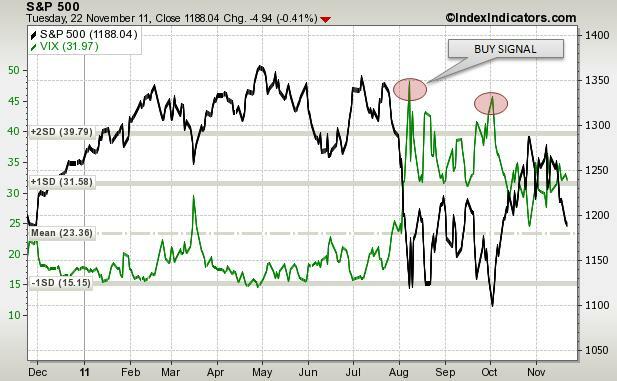 Although market rallied and VIX touched 25 in late October current slump rises markets fear. In such conditions VIX levels above +1 standard deviation (31.58) is proven to be best time to load. Definately market have been under pressure last month and prices now are attractive. Unfortunately things first go wrong before start going better and this is would be the case for next couple of days considering current negative market sentiment. However this is the time to be cautious in order to catch the following sweet rally. In this weekly sentiment review indicators show more bullish signals as markets tend to rebound from August lows. Investors are still cautious measured by investors fear gauge (VIX), although the indicator stalled showing reversal signs. Number of companies above 50 MA started to rise with markets rebounding but its move coincides strictly with S&P500 index move. Current reading of 35% of the companies out of the S&P still indicates oversold signals, leaving markets place to recover. Levels between 10% and 35% signal oversold markets since those levels are -1 to -2 standard deviations from mean level of 59% for the period one year back. 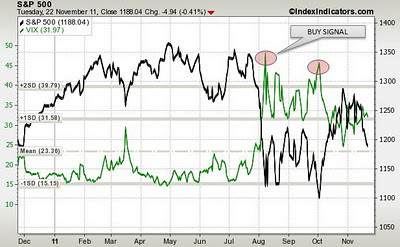 Put/call ratio is falling from its extreme levels in mid August signalling fading bear mood. If compared to previous year correction started April 2010 the indicator's peak is higher in current, which means that current market is heavy oversold. In April 2010 put/call ratio started falling but market trend reversed after the ratio crossed its mean (0.92). Still we are far away from that level, however direction is downward, sign for upcoming reversal. Just before the sell-off one month ago I predicted recent market drop in the post Next market wave and signalled it in June post S&P Technical Outlook. Actually it was not me but the Elliot Wave Theory used in the analysis. Current market condition suggests that applied wave analysis was correct, which leads to the question regarding next market move. 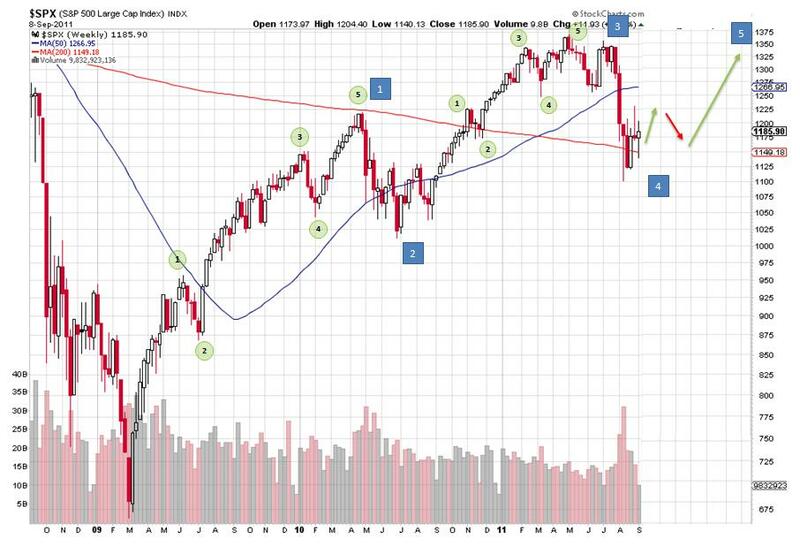 There are clear signals that latest correction shaped fourth wave. Considering that and if we assume it bottomed out at 1072 we should be at the beginning of new bullish market - the last fifth wave of the theory. Recall last correction (third wave), which lasted 4 months, we should be in the middle of current pull back. That statement is supported by weak macro data and huge uncertainty about further easing from FED. According to Bernanke's statement inflation is "on its way down" thus indicating that possibility of implementing stimulus package is rising although its shape is expected to be different from last two QE's. Meantime President Obama signalled new jobs plan which is claims to support hard hit labour market. 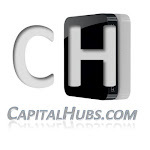 $447 bln Jobs Stimulus Plan includes investments in infrastructure and tax vacation for small businesses. The plan is going to be financed with next decade tax increases. Last proposal disappointed markets yesterday and they reversed the initial rally. Historically September and October have been crucial for the markets. If mentioned above policies are implemented they could be positive for the financial markets and thus give a boost, completing last fifth wave from the bull market started March 2009. The correct policy at the moment is not austerity sacrificing the growth but shоrt term stimulus in order to stabilize the fragile economy and after is generates enough growth followed by long term consistent austerity measures. 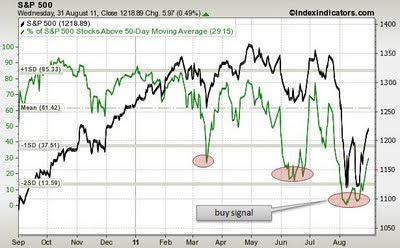 Recent days all sentiment indicators show oversold markets. There is large level of uncertainty and thus high volatility still shaking markets. Recent rally gave some relief and question is whether it is going to last for a while. Weekly review of the sentiment indicators shows short term market mood and could give us clue for next one. The charts analysed below plot specified indicator on left hand axis and SandP500 index value on right hand. Total put/call ratio is at one year high. This is bullish signal since the measure is above its +2SD (standard deviation). As seen in mid June extreme levels indicate market bottoms. According to put/call ratio we should be in such at the moment. 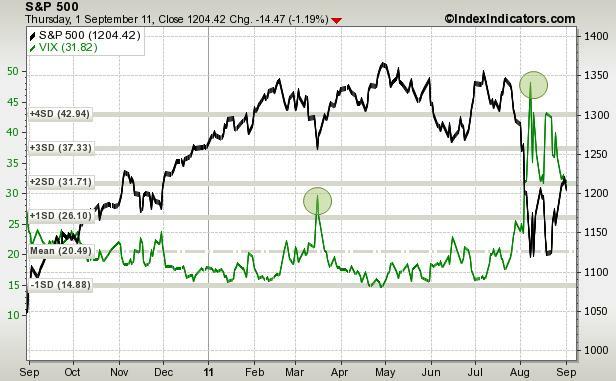 After reaching two year peak volatility index started declining. Now at level of 32 markets calculate high possibility of double dip. Levels above 30 are crucial for market confidence, since investors perceive higher volatility with downturn. S&P500 relative to its 200 day moving average indicates the spread between mentioned. It is straightforward measure and is positively correlated with actual index move. 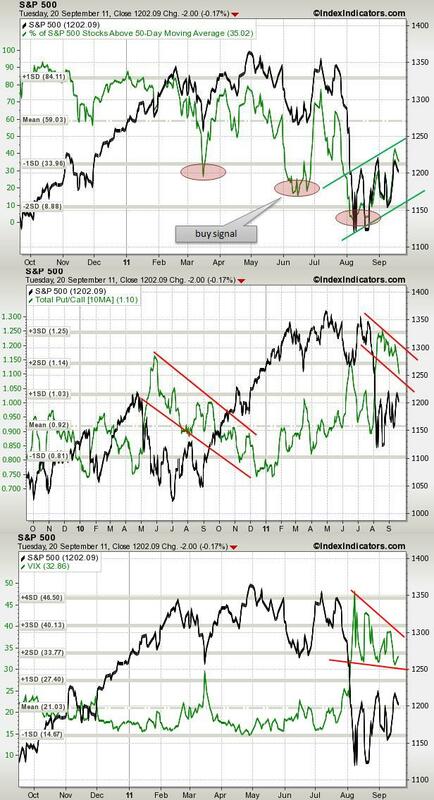 It shows deviation of the market from its long term trend. On the chart is visible that currently market is 6% under its 200 MA and indicator is under -2SD – extreme negative value signalling oversold market. Last week was very volatile for the markets. Obviously the bottom has been formed, at least short term one, since S&P500 returned 9.6% in just 7 days. Right scale of the graph shows the value of the index and the left indicator. The indicator on the chart shows, however, that there are still room for growth after only 29% of companies in the index trade over their 50 day moving average. 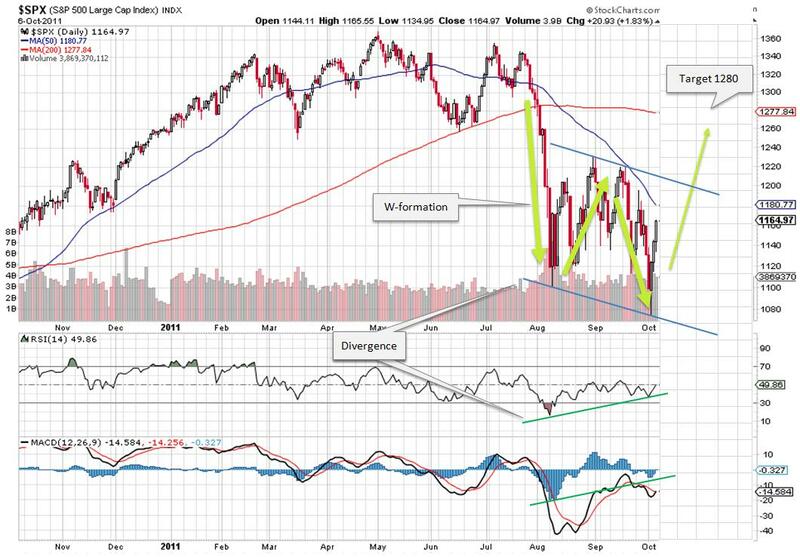 Values ​​below-1SD (standard deviation) is a signal to buy, as seen in the previous two corrections. This indicator has shown historically that can induce relatively accurate entry levels. Still the rally is fragile since investors are cautiously buying after sharp selloff seen previous weeks. Most attractive at the moment are blue chip companies with stable growth prospective. Therefore we can not expect a sharp return rather moderate growth, which will depend mainly on data on employment and unemployment and potential of the world's leading economies to generate growth that can lead us out of crisis.